The Series HH9 Metering Pump is designed for very low output injection into high pressure systems. 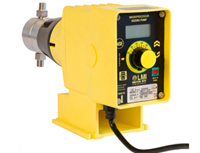 An electronic pump with a 316 S.S. packed plunger liquid end provide users with all the advantages of an electronic pump in applications where previously only motor-driven pumps could be used. Click here for LMI Series H9 Detailed Specifications.